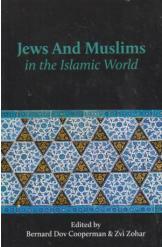 Jews and Muslims in the Islamic World edited by Bernard Dov Cooperman and Zvi Zohar, University Press of Maryland, 2013, new book, excellent condition, 384 pages. The book is a compilation of a conference held in August 2007at the University of Maryland. Jews and Arabs have interacted on daily basis for over 14 centuries. This book comprises 20 articles about the interaction of Jews and Arabs in the Middle East and Mediterranean lands in various realms including religion, social life, science, music and folklore. Among the numerous subjects presented: Conversion to and from Islam; The Emancipation of North African Jewish Women; Jewish and Muslim Houses of Prayer; Revisiting Jihad; Islam and Sabbatanism; Jewish Muslim Relations; Activity of Satmar Hassidim in Yemen; The Jews of Al Andalus; The Rabbi and the Mufti Against the Priest.